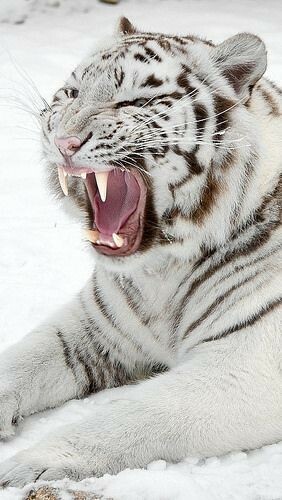 The white tiger is a rare pigmentation variant of the Bengal tiger. 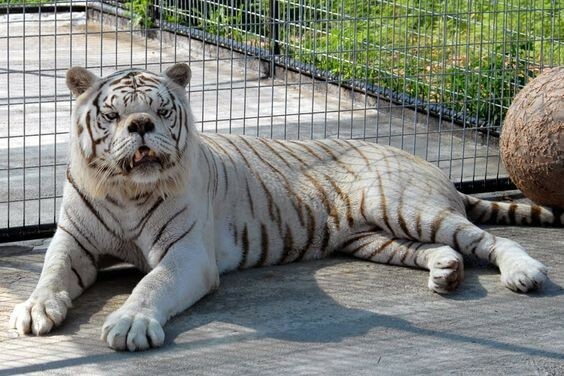 The color white is due to the lack pheomelanin pigment that naturally produces a tiger its orange coloration. 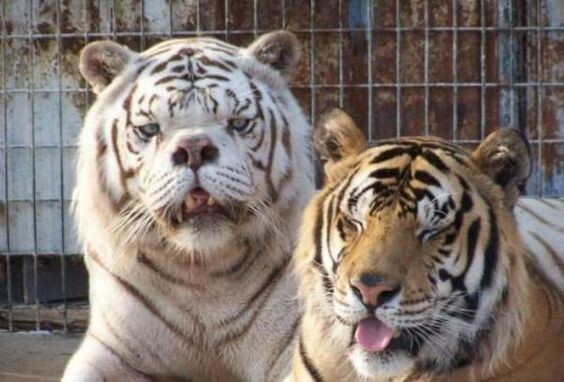 On the other hand, the eumelanin are still produced which is why white tigers are not considered to be albinos. White tigers gained so much popularity as lots of people became interested with the ghostly white coloration and sapphire blue eyes of these tigers. Breeders, exhibitors and facilities claiming sanctuary status are all equally charmed with these white beauties. Sadly, white tigers are being artificially bred to make money. According to reports, breeders can earn as much as 60,000USD for a white tiger cub. The nonstop breeding leads to more and more tigers bred with physical and mental problems. Certainly, white tiger artificial breeding has disturbing results as the schemes employed has a huge impact on the genetic diversity of these animals. Although, we recognize the fact that these efforts is to offer a stable population of endangered animals, it appears that the negative effects overpowers the positive ones. 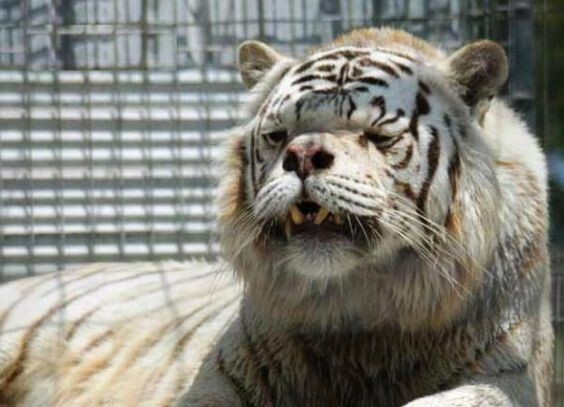 Kenny, the first white tiger with Down syndrome has captivated the hearts of so many people around the globe. 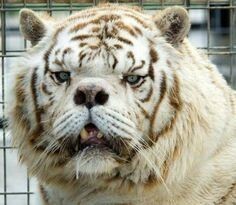 He was an inbred white tiger that was selectively inbred while in captivity in the United States. His parents were a brother and sister who were both carriers of the recessive white gene. Clearly, Kenny, acquired both of his mother and father’s recessive genes. This could be the major reason why he was born with multiple abnormalities. Kenny lived his life with deformities, mental retardation and huge physical limitations. Kenny was described as very friendly and non-aggressive. His friendliness and strange look attracted lots of visitors who fell in love with him. He shared an enclosure with his brother, Willy. Kenny died at the age of 10 in 2008 at the Wildlife Refuge in Eureka Springs Arkansas. 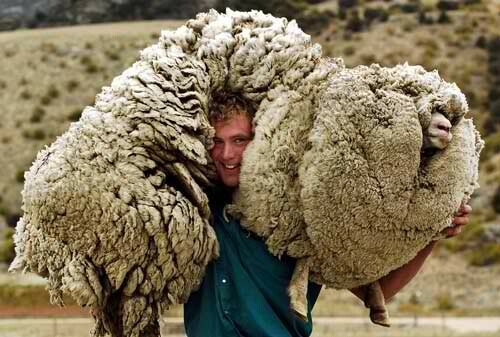 Clearly, Kenny was a victim of the breeding industry. Regardless of Kenny’s fate and the repeated deaths of white tiger cubs, breeders continue to produce inbred white tigers. 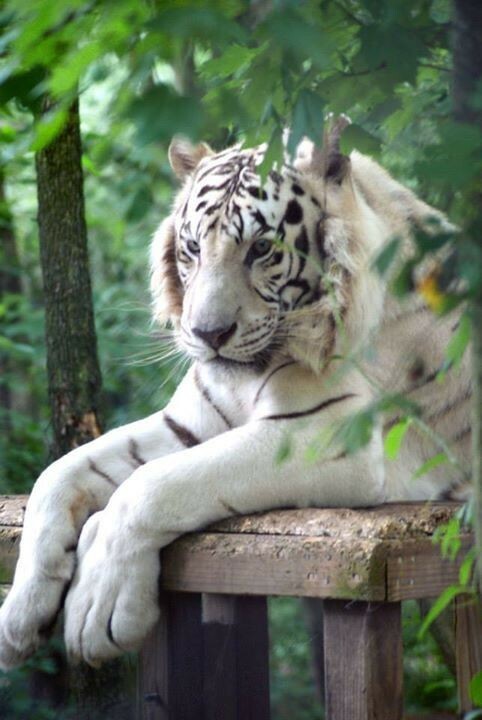 Currently, sanctuaries are advocating the welfare of white tigers. These sanctuaries are educating the public about the negative effects of breeding white tigers and the horrible sad stories surrounding artificial breeding. Always remember the story of Kenny, every time you see a white tiger, keep in mind their suffering, deformities and health problems.